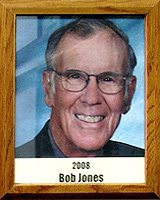 Bob Jones served as the athletic director for the Tucson Unified School District, overseeing high school and junior high school athletic programs as well as speech, drama and musical activities. He was chosen Arizona Athletic Director of the Year for 1984-85. He was vice-president of the Arizona Coaches Association board of directors, chairman of the Southern Division of the Class AAA Conference, a member of the AIA executive board and the legislative council. Bob also has a lot experience as a coach of baseball and basketball at Palo Verde and Pueblo high schools in the 1950s and 1960s, as well as American Legion ball. He coached the Arizona South All-Star basketball team in 1961. Bob played baseball in semi-pro and minor leagues in Canada and the United States, including playing for the Class C Tucson Cowboys in 1958. He also played fast-pitch softball. Bob has assisted with local Punt, Pass and Kick contests, Parks and Recreation and Little League functions and many other organizations in the community.